A new quick release off-load lifting hook is being introduced at Seawork by H Henriksen of Norway for use principally with emergency rescue boats (Stand A237). The new hook is the first in the world to be compliant with the newly introduced NORSOK R-002 lifting equipment regulations. These have been formulated by the Norwegian petroleum industry and are intended to increase the levels of safety principally within Norwegian waters and for Norwegian-based vessels. They are most likely to be applied in the Norwegian sector of the North Sea but they are also expected to set a new benchmark for safety standards in the offshore industry globally. The new Henriksen hooks are made to satisfy the NORSOK requirement for them to be able to perform to their full load capacity regardless of the angle of the boat in relation to the lifting cable. It has been recognised that lateral loads can impose significant strains so the new hook features a specially designed swivel that pivots in all directions and enables the hook to accept a load from any direction. The new Henriksen NORHMK range of hooks are each certified for use with loads of five, ten and up to 15 tonnes. They are also tested to be capable of holding loads up to nine times greater than their certified capacity. This is an independent move that surpasses the existing SOLAS requirement for lifting hooks to be tested to just six times their certified load. During development at the Henriksen factory beside the Oslo fjord, a hook was tested to 160 tonnes before it eventually broke. H Henriksen is generally acknowledged as the world leader in the manufacture of single point off-load lifting hooks. 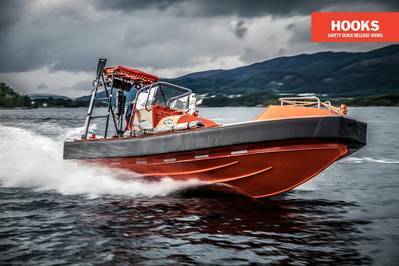 These represent the safest, fastest and most efficient way of launching rescue boats and other craft in difficult sea conditions. When the boat has been lifted and swung out from its cradle and is being lowered to the sea, a crew member removes a safety pin and releases the hook handle. As soon as the boat touches the water and its weight comes off the cable, the hook opens automatically. This eliminates the risk of the hook being opened when the boat is still some height above a trough in the waves. With the entire weight of the boat, its passengers, crew and its cargo being dependent upon a single, relatively small piece of metal, Henriksen engineers believe that boat operators should pay close attention to the long term stresses to which their hooks are exposed and they should never be tempted to cut corners with their metallurgical quality, design or maintenance. Henriksen hooks can be serviced and re-certified for use after five years being manufactured in Norway to the highest Scandinavian standards of metallurgy and engineering and reflect the company’s continuous commitment to the science of safety.